Parish to celebrate 160 years of community service – Welcome to Wyandotte Daily! Responding to the needs of the neighborhood is nothing new for St. Paul’s Episcopal Church in Kansas City, Kansas. The parish, which is celebrating 160 years of serving its members and the larger community, will hold special events Saturday, April 21, at its present location, 1300 N. 18th St. The parish, which was founded in 1857, helped feed starving Wyandotte Indians during its early days. The parish, which was originally near what is now Fourth Street and State Avenue, had a garden and orchard and shared its bounty with those who were less fortunate. About the same time, the parish conducted a school for children in the time before public schools were established. The parish was later at Sixth Street and Ann Avenue and then 712 State Ave.
Those who will attend the celebration will see two successful outreach programs that the parish sponsors as it makes a transition to a center for mission and ministry. The Breakfast at St. Paul’s will be held from 9 a.m. until 10:30 a.m. April 21 in the parish hall. This program was started about 20 years ago with generous support from a sister parish, St. Michael and All Angels Episcopal Church, Mission. An average of about 200 attend the breakfast each week; many who come are homeless. Various other churches and other volunteer groups help serve the meal. The neighborhood pantry will be open from 10 a.m. until 12:30 p.m. April 21. The pantry, with help from Nourish KC (formerly Episcopal Community Services) provides food for about 3,000 meals each month. A festive Holy Eucharist will be held at 2 p.m. April 21. The co-celebrants will be the Rt. Rev. 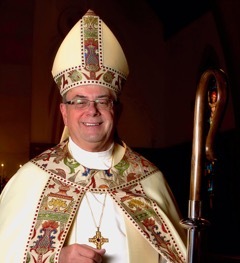 Michael Pierce Milliken, the bishop of the Episcopal Diocese of Western Kansas; and the Very Rev. 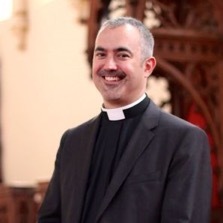 Craig Loya, the dean of Trinity Cathedral in Omaha. The Rev. 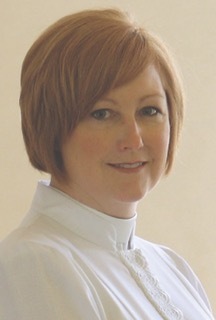 Dixie Roberts Junk, the priest-in-charge at St. Paul’s, will assist. New altar cloths, vestments and a banner will be dedicated. A gala celebration is planned at 3:30 p.m. April 21 in the parish hall. Members who are 80 years or older will be honored. Former members and friends have been invited to the celebration.